There are books I like. And, there are books that — let’s be honest — I want to hug. Books that astound me. Books that I read. Then read again with wonder. Then try to convince everyone I’ve ever met to read as well. All while wishing I could have written something so amazing. It may not surprise you that I encountered one of those books recently. I was visiting Books of Wonder in New York City (which was a bucket list moment for me in itself). 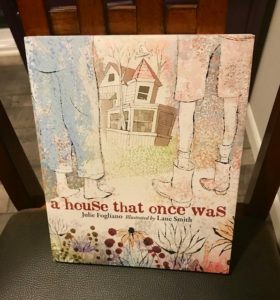 That’s when I saw A HOUSE THAT ONCE WAS — written by Julie Fogliano, illustrated by Lane Smith and published by Roaring Brook Press earlier this year. I hadn’t heard much about the book itself. But I was very familiar with Julie. In fact, one of her previous books — IF YOU WANT TO SEE A WHALE — falls into the category of huggable books that astound me and I think everyone should read. So I had to see what she was up to next. I bought the book without reading it — which is a true testament to my respect for Julie and Lane. When I got back to my hotel room, I sat on the bed and read. And a few pages in, I knew. This was another book for the “astounding” category. And, yes, I did hug it, though I don’t think anybody saw. So. I obviously think you should read it. But now, I’m going to try and break down why I think it’s so good. Which is a little hard to do, because who can adequately describe love? But for you — for the sake of art itself — I will try. but now it is peeling. A house that was once painted blue. There’s some near rhyme here, but what makes this book a poem is the rhythm and the lyricism of the language. There’s no punctuation except the periods, but the way the lines break, you know exactly how you’re supposed to read it. And that, my friends, is the mark of a good picture book. Any reader should be able to pick it up and get the rhythm right. Which is why I often make my husband or daughter read my stuff out loud to see if they’re seeing it the same way I am. It’s very enlightening. If you find yourself saying: “No, that’s not how to DO it,” the fault is with you, not your reader. Another trait worth emulating is the simple word choice. The first stanza has all one-syllable words except for “isn’t.” And they’re all words many grade schoolers know and could read. The second stanza has a few more two-syllable words — “leaning,” “wasn’t,” “peeling” and “painted.” But again, the language is simple and spare. A window that once opened wide. A window that now has no window at all. A window that says climb inside. There’s a lot of love in this book. For walks in the woods. For the past. For those who wonder. And for our neighbors — even those we haven’t met. There’s also a sense of security. Here’s what happens at the end of a day of exploring. we climb as we wonder. Back down the path that is tangled with thorns. Back to a house where our dinner is waiting. Back to a home that is cozy and warm. Because nothing gives you the courage to venture into the unknown like knowing you have somewhere safe to return. So, please. Read this book. Buy this book. Share this book. And give it a hug from me. Fiction, Julie Fogliano, Lane Smith, Pat Zietlow Miller, picture book. Bookmark. Wow, I can’t believe I missed this book, too. I am running to get it now! Thank you for sharing such a beautiful post, Pat! Beautiful writing! Thanks for your thoughts on it, Pat! What a delight. Try pairing with Virginia Lee Burton’s “The Little House” for more cozy PB love. Wow! This looks and sounds amazing on all levels! Poetic and provocative – hugs to you for sharing it!! thank you for letting me know about this book I am reserving it now. I loved this book. As you said, it’s a poem. “Huggable” is right. I agree, a big hug, try not to cry book. I remember finishing it and wow, and trying to figure out what made it so special. Just requested it for myself here at the library! Can’t wait to read it! Thank you for sharing. Thanks for the recommendation! I love Julie’s books. Thanks for this, Pat. I hadn’t seen it. I love Julie and Lane’s work as well, and am excited to read A House that Once Was. This book looks wonderful. I reserved it at the library. All copies were out. Thanks, Pat, for introducing me to this lovely book. Pat, I felt the same way when I read this book. It’s magical, filled with wonder and speaks directly to those parts of us. Thanks for sharing with others this wonderful book. What a fresh, lyrical story that sparks the imagination. I can’t pass an abandoned house and barn without imagining unknown worlds. My library has 11 holds on 4 copies! I guess I’ll think about buying this one. Pat, this is beautiful. I’m running out to get my copy now! Thank you for this wonderful blog. I am grateful for the way you break down the story into different aspects of the writing–the particulars and the whole gestalt of the feeling of the story. The examples provided make me want to buy this book right away! And it is always good to be reminded that rhyme comes in different forms and sometimes the whole manuscript reads as a lyrical poem without a regular rhyme pattern. What great concepts in this book–exploration, wonder, imagination, respect for what has been, and security for what is safe and warm. Wow! I did not know about this PB. Another gem of an author to study. Thank you. Thanks for the recommendation, Pat! This book sounds lovely. I need to get this one! There was an old house not far from where we once lived that could have been this house. Your review brings back memories (and some sadness because the house was torn down). This is on my must have list. Love her books too, Pat, and will pick this one up at the library soon! Yes! I will buy it. And I will hug it. Thank you, Pat. Wow! Sounds like a great book! Don’t we all wonder when we see a forgotten home, who lived there and what story there is hidden in the walls? Thanks for sharing with us! I must pick this one up! Thanks for sharing! Wonderful review that makes me want to hug A House that Once Was, too. You couldn’t be more right, Pat. This is indeed a beautiful read-aloud and a wonderful mentor text. Thanks for sharing.